• 51 sq. m., 1 bath, 1 bdrm apartment - €44,950 EUR - Title Deeds & Furnished - NOW SOLD! 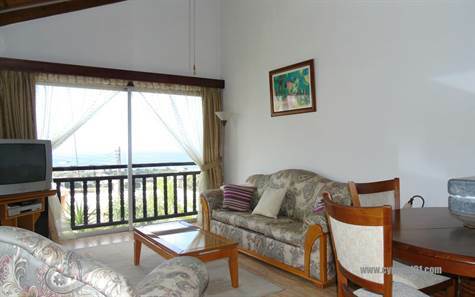 Chlorakas, Paphos - This top floor one bedroom apartment is situated in a residential cul-de-sac in the popular village of Chloraka, within a short distance to the beach, local shops/restaurants and transportation services. The property features a spacious open plan living room with wooden beamed ceiling and galley style kitchen. Wonderful sea views can be enjoyed from the large windows to the front, and windows to the left provide easy access to a side balcony. The kitchen is well equipped with built-in oven, gas hob and extractor fan, fridge and washing machine. A hallway to the rear of the living room leads to a modern fully fitted bathroom and large double size bedroom with fitted wardrobes. The property is ideal as a holiday home or rental investment. It comes fully furnished and has title deeds. Please refer to MLS#: 1327 when inquiring.